Imphal, October 20: Notwithstanding its scenic beauty, Ukhrul�s charm magnified by the growth of the rare Shirui Lily and location of the mythical Kangkhui cave associated since time immemorial with the life and art of the Tangkhuls, the region is made even richer by the age-old practice of making Nungbee Chaphu (pot) which is also an indelible feature of the Tangkhuls. Traditionally a domain of Tangkhul artisans residing in Nungbi (Longpi) village of the district which is about 40 kilometres from the district headquarters on the Jessami road, the revered pot may not be as rich in artistry compared to the world famous China clay products and different from other potteries, nevertheless occupies a significant place in the history and lifestyles of the Tangkhuls. The uniqueness of Nungbee Chapu is the availability of raw material only in Nungbi area where a type of soft rock is grounded into dust particles, beaten and mixed with water to convert into mud paste before being moulded by hand to resemble pot form. Taste of dishes made in Nungbee Chapus is another of its unique feature, according to a village elder who further listed flower pots and other decorative items for commercial purpose as source of economic sustenance of the Nungbi people. The soft rock variety locally called hamlei and found only in a place called Salla is the only ingredient used in making Nungbi Chapu and utmost care is taken to ensure no other material mixes with it. The finish products are dried in Sun light before being baked for the end produce after which a leaf variety is rubbed for the shine. detailing on the making of Nungbi Chapu a middle age artisan from Nungbi Kachui village called Pamio, reiterating uniqueness of the pot form recalled that its shape had withstood test and passage of time as most of the design remain synonymous with those produced by Nungbi forefathers. 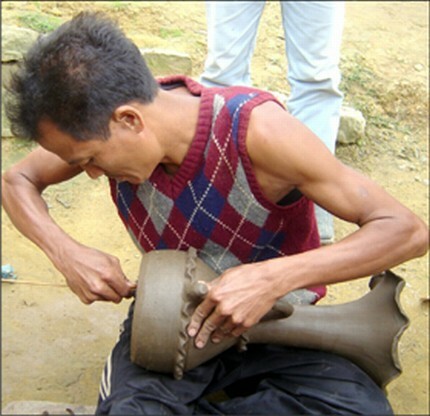 Sharing with a group of media persons that grinding of soft rocks is the most arduous part of the pot making job, Pamio also expressed elation that Nungbee Chapus, in the past found only in Tangkhul households could these days be exported to Imphal, Kohima, Dimapur and beyond fetching a handsome price. The prices based on its shape and size according to requirements of different places and the people is said to range from Rs 50 to Rs 1000 with a family of Nungbi village able to earn about Rs 45000 in a month. Besides the grinding part of pot works Nungbee Chapu artisans also face problem of efficient pot wheel, maintained Pamio who however hastened to add that with the assistance of Kolkata-based Central Glass and Ceramic Research Institute and Manipur Science and Technology Council, infrastructural impediment could be addressed to a certain extent after the formation of Longpi Earthen Handicraft Cooperative Society. With the establishment of the Society, modern machineries to ground the suitable rock had been purchased subsequently resulting in the increase in number of member craftspersons who are also able to acquire a tin of rock dust at Rs 25 each. Even though the Society could churn out around 50 pots a day the task and time consumption of drying and baking the products still remain as before, added Pamio.